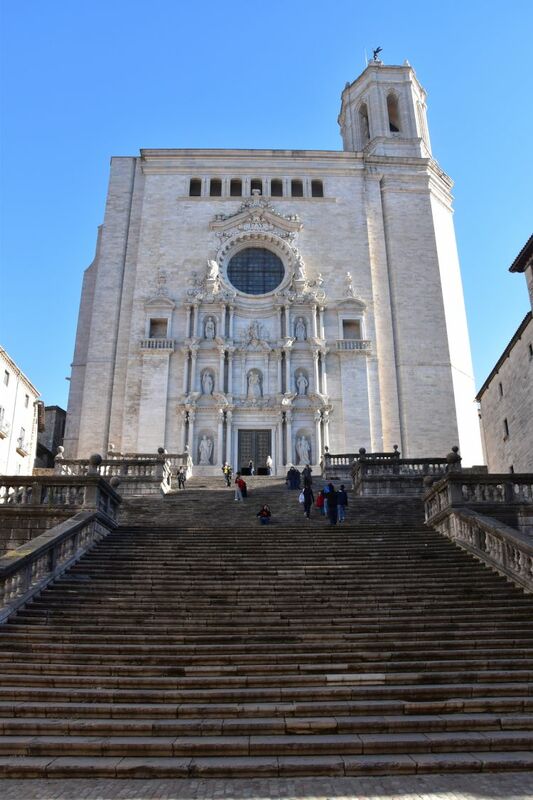 In November 2018 we spent three weeks near Tarragona. Now we head north again, to the Costa Brava, Girona and Cadaqués. 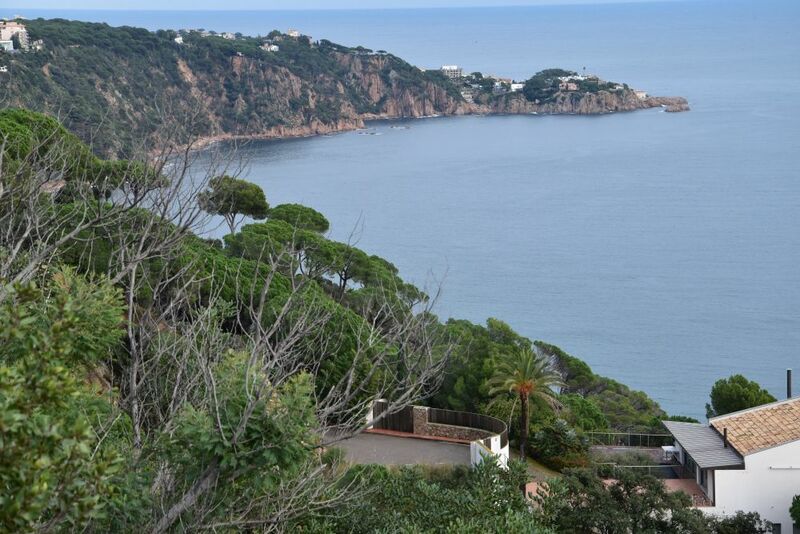 From Torres del Mar we follow the coast line of the Costa Brava. On the map, the road looks very curvy… and yes, they ARE curvy. One bay after the next. Wild rocks. Some houses along the steep rocky slopes. And at the foot of the rocks, in the bay, a small sand beach with amenities for bathing in the Mediterranean Sea. 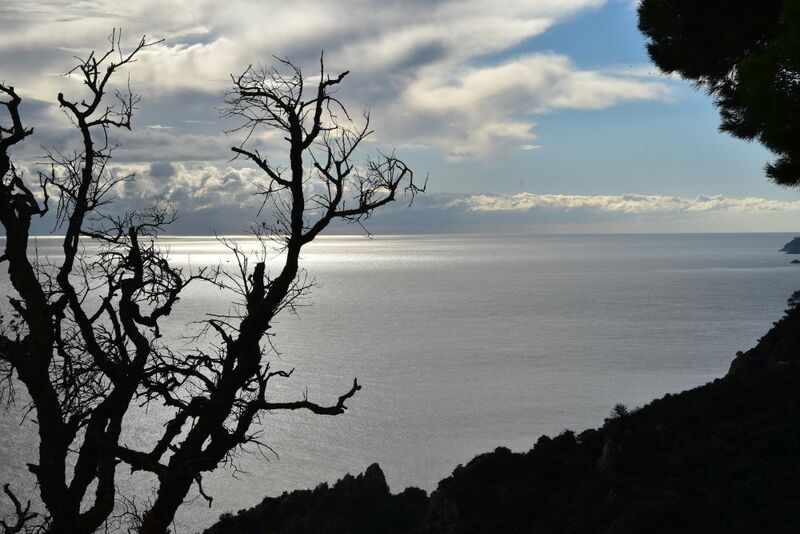 We enjoy the romantic views, as the sun plays with the clouds. 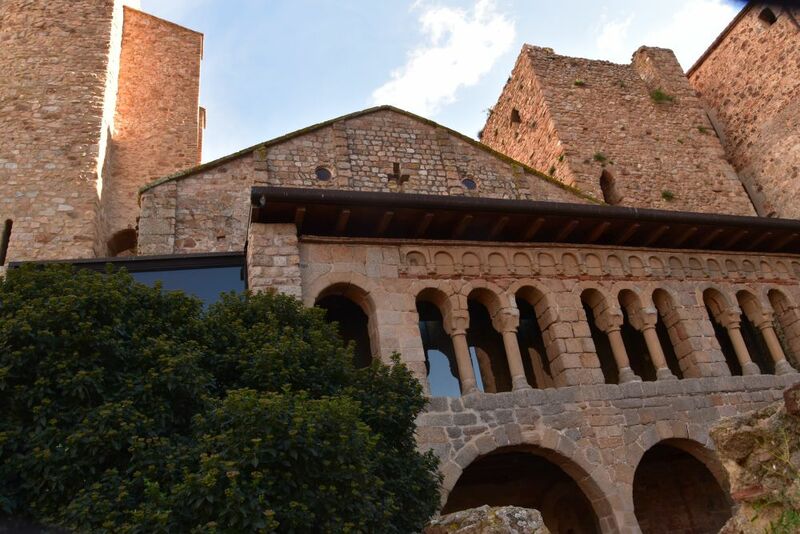 After having curved along the scarcely populated rocky bays, we reach the resort Sant Feliu de Guíxols with ist Benedictine monastery from the 10th century. All Museums, everything is closed now, end of November. 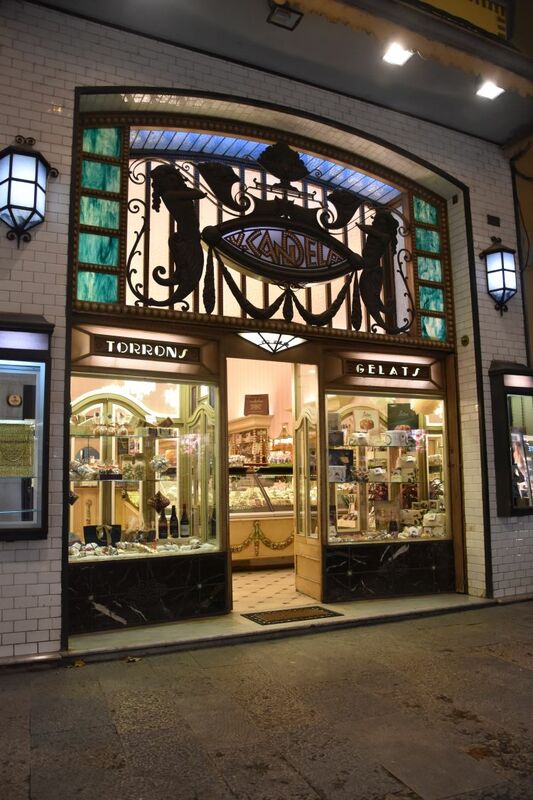 We walk through the narrow streets of the old town, find a nice restaurant open in the otherwise quiet Rambla and yes, there is even a shop for pets. I am sure, this place will be very busy in summer. 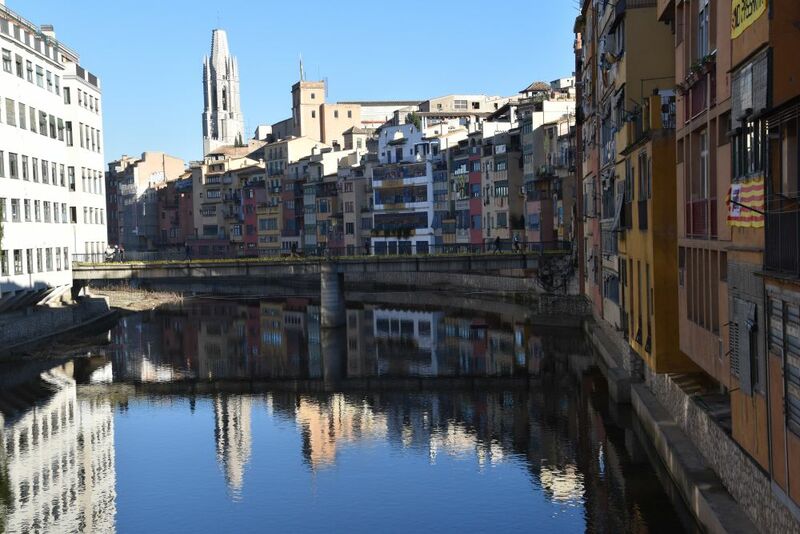 A fast national road takes us to Girona (pronounced Jirona). We stay in the hotel Carlemany, and I learn, “Carlemany” is Catalan for “Charles the Great”, “Karl der Grosse” or “Charlemagne”. The people of Girona remember him. He conquered Girona from the muslims already at the end of the 8th century. It was then pingponged between Christians and Muslims until the 11th century. Then it remained with the Christians as part of Catalonia. 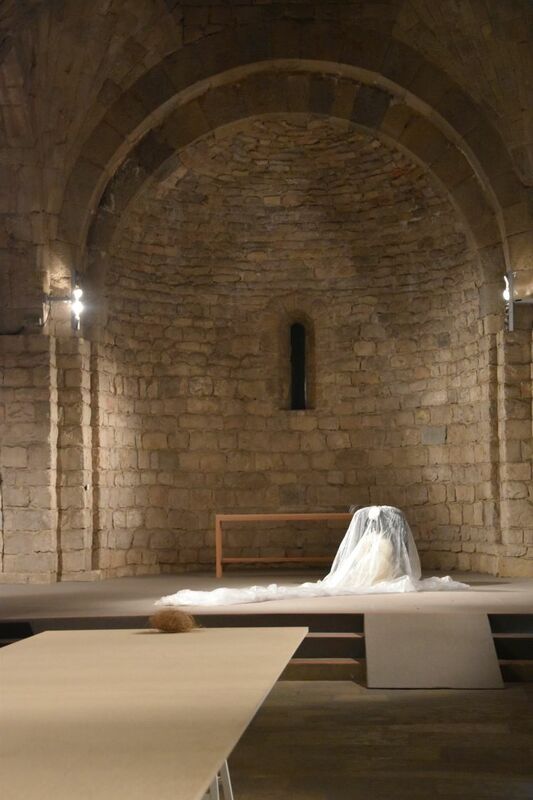 … and we discover some Art Modern that is present all over in Catalonia. 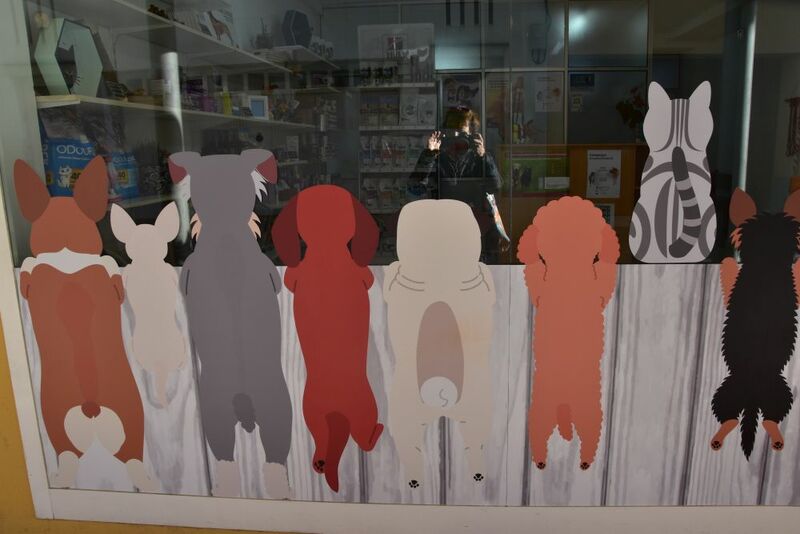 … and visit the “Els Banys Arabs”. They have been built around 1200, after the Arabs had left, perhaps by mudejar masters (Dumont, p. 123). This is the tower above the entrance hall. It gives access to the remains of the cold, the warm and the hot room. 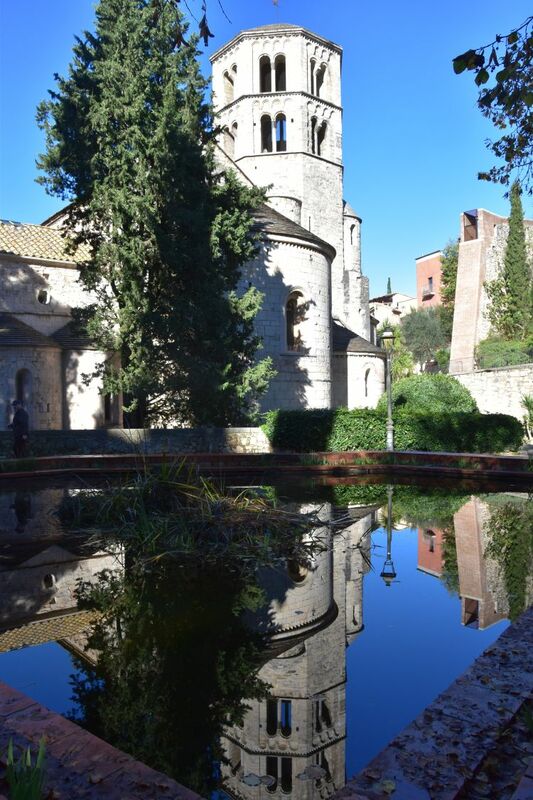 … an this is the charming belfry in Lombardian style reflecting in the pond of the garden. 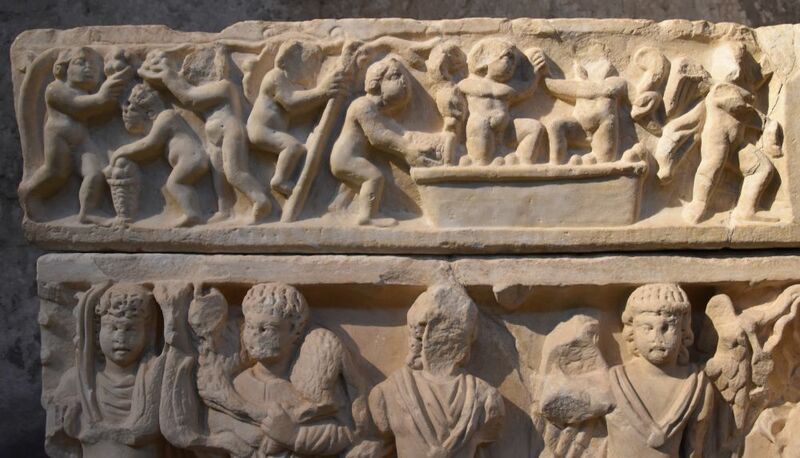 … with some treasures such as the Roman tomb that shows the elaboration of wine: The grapes are picked in the vineyard and then tramped in the trough. 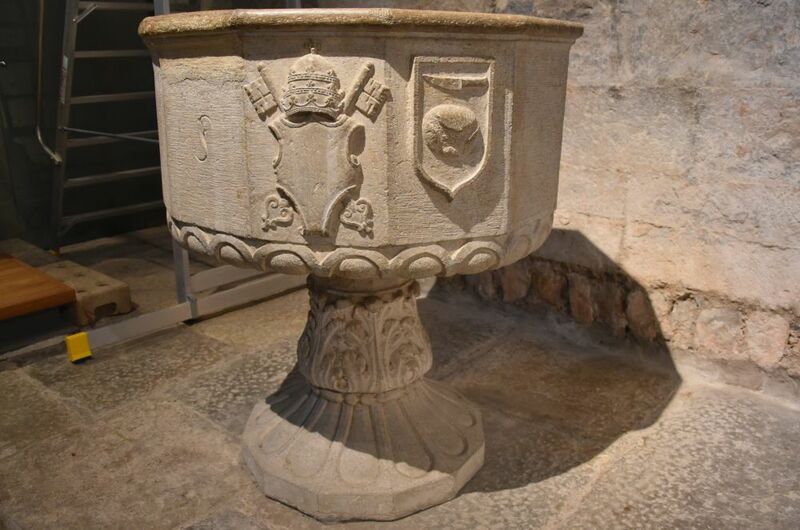 I also like the baptismal font. 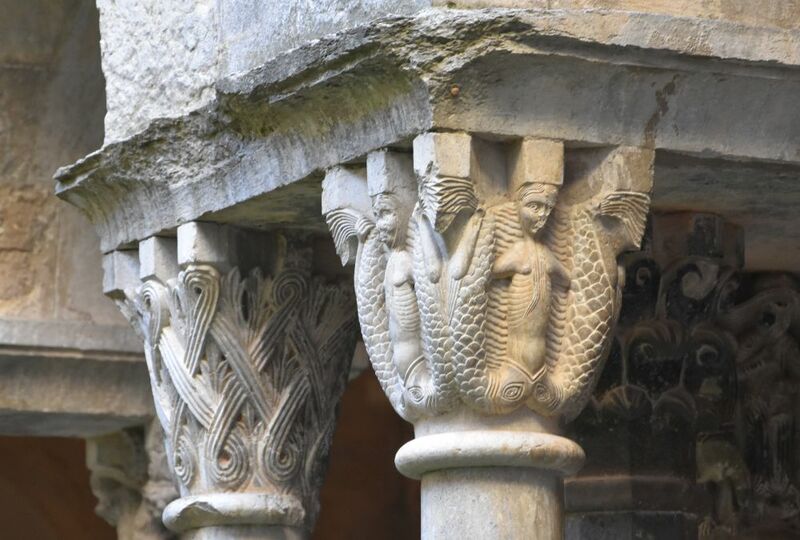 … such as this one where two fish seem to swallow a women. In the museum we find a wonderful exihibition of Roman toys, amongst them bones. 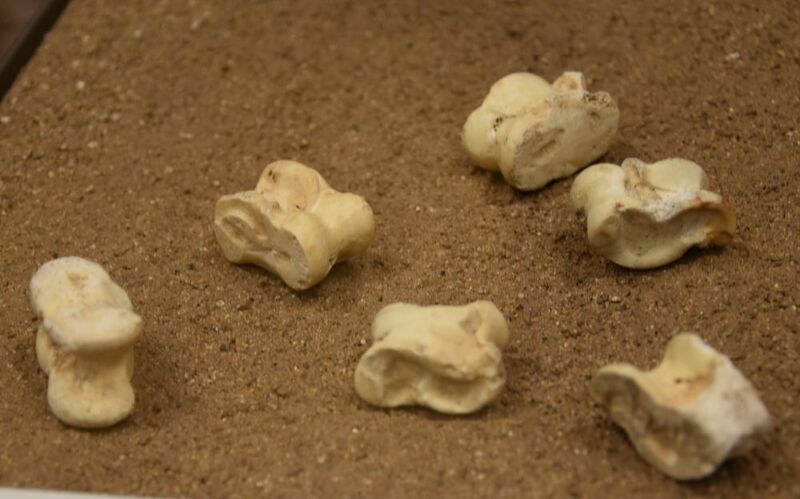 Interesting, in Mongolia we have played with such bones as well . 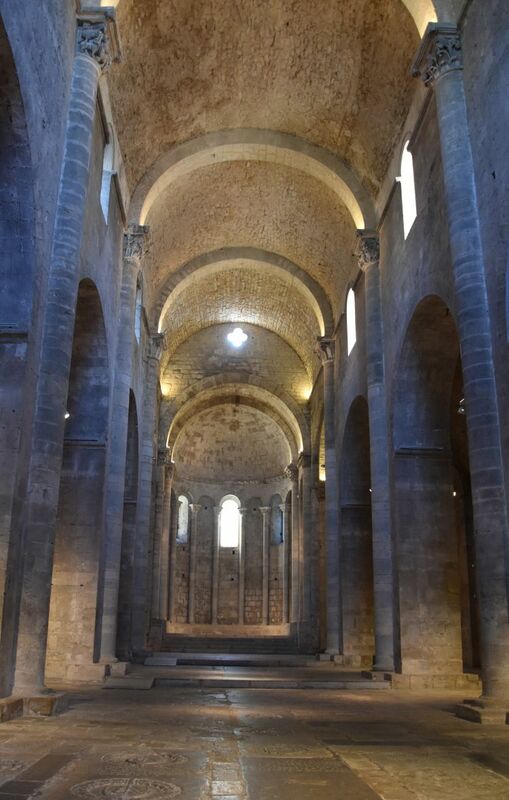 Next to Sant Pere de Calligans, we enter the 12th century chapel of Sant Nicolau with its Romanesque vaults. It is now an art gallery. We find a transparent plastic plane with a brush (I believe) and white spots as well as a long chipboard with some bales of straw. Interesting pieces of art and for me somewhat difficult to understand. 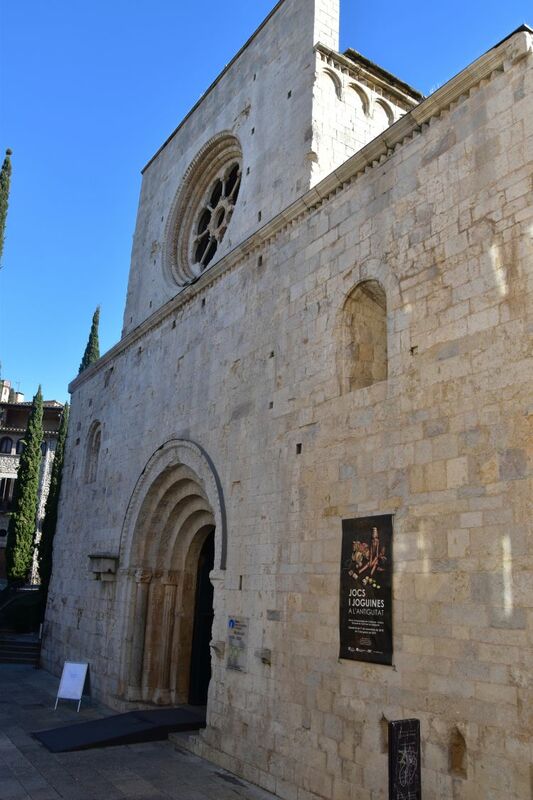 It took a thousand years to complete the Cathedral of Santa Maria – the styles of several periods are mixed. Imposing reverence, the cathedral welcomes the visitors with the 18th century baroque facade above the long stariway completed in the 17th century – 3 times 30 steps. The huge gothic nave covered with the ONE sequence of ribbed vaults is impressive. The nave is 34m high and 22.6m wide. This is the largest of all gothic vault constructions. 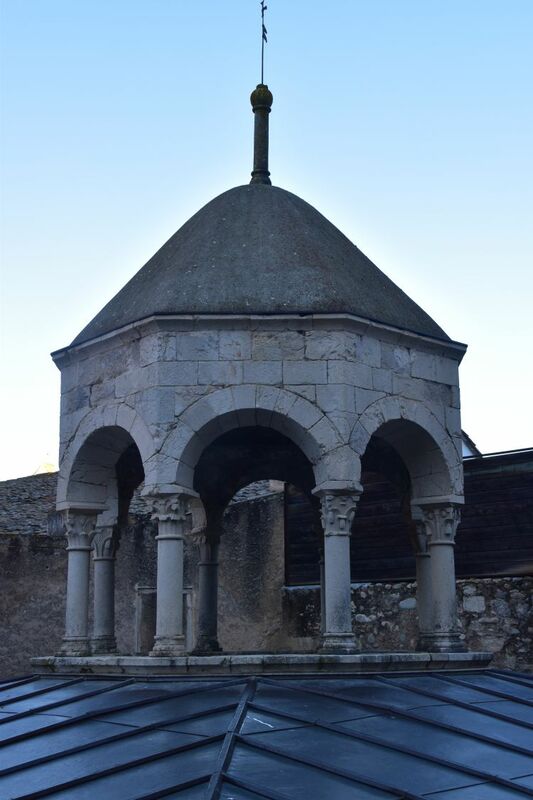 The choir built in the 14th century has still been conceived with three naves. Later the idea came up to build the longhouse as one single nave. The risk was high. 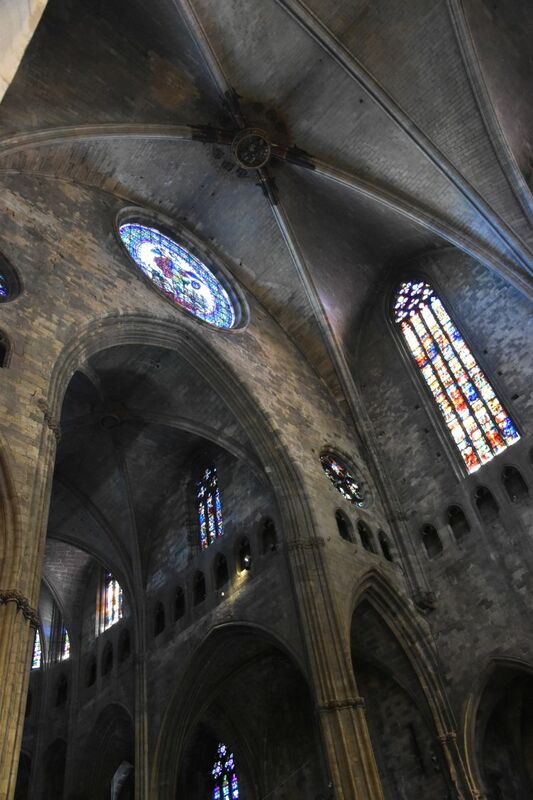 In 1417 the architect Guillem Bofill accepted the task and completed it (Dumont, p. 118). 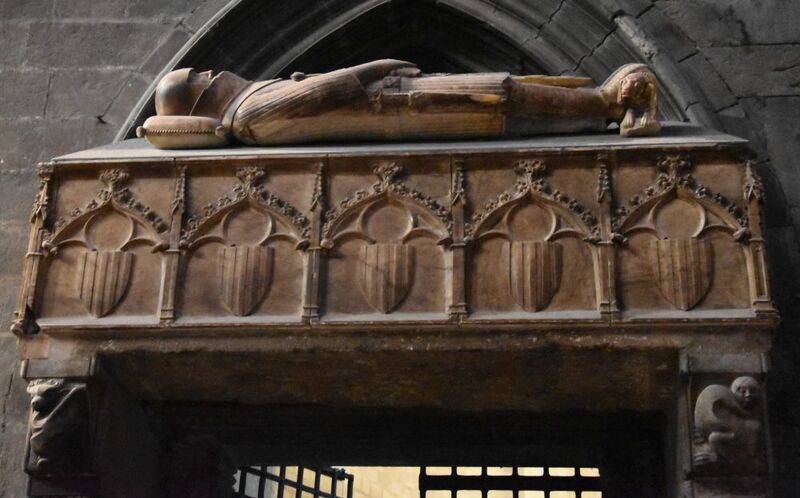 Treasures inside include this tomb – the bishop lies on his comfortable cushion made out of stone and his feet are resting on his faithful dog. 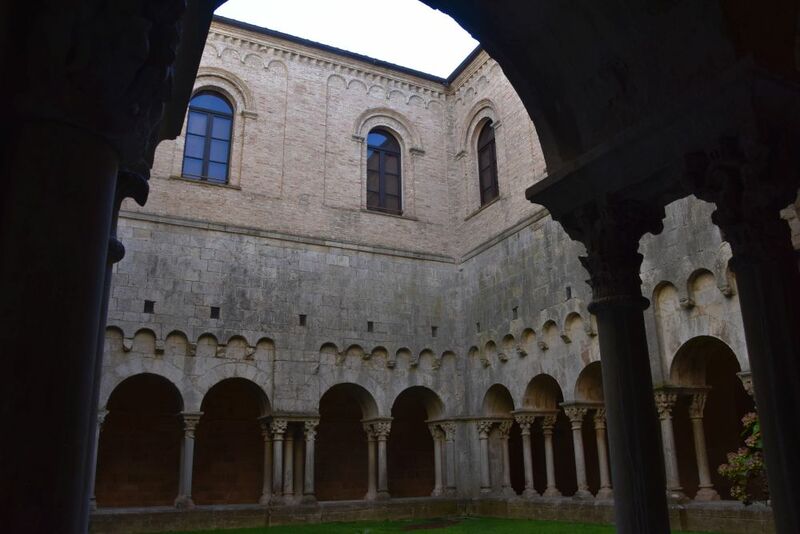 The beautiful cloister from the 12th century covers primarily themes from the Old Testament. 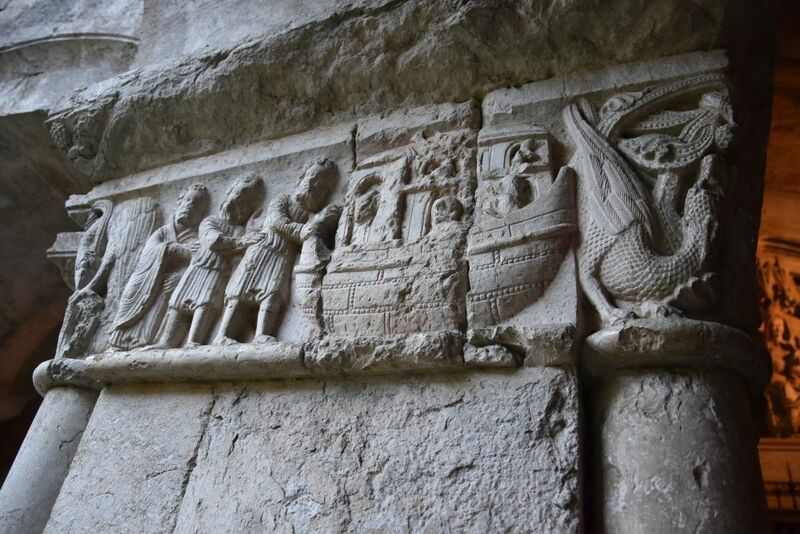 Below Noah’s ark is being loaded with his family and the animals in pairs. 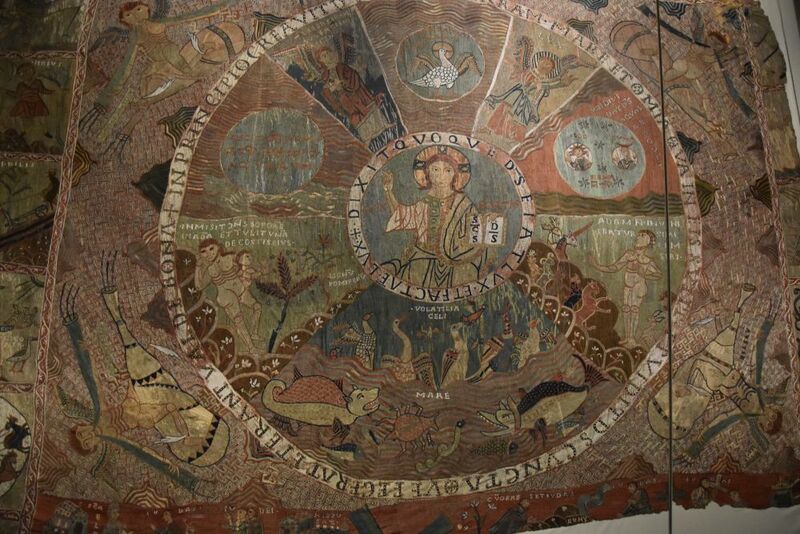 In the marvellous museum attached to the Cathedral we find the carpet of world creation from around 1100. It is silk embroidery. The Pantocrator is surrounded by several episodes of the world creation such as Adam giving names to the animals and Eva being born from his ribs. The pictures are perhaps based on an early Christian mosaic from Roman times (Dumont, p. 122). To wrap up our day, we climb the city walls near the Cathedral and walk on them up to Plaça Catalunya. 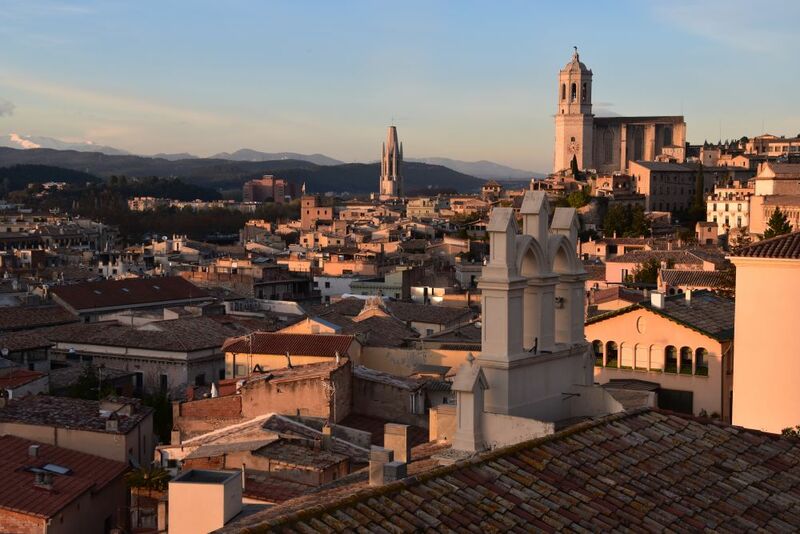 The views of the old town with the Cathedral and the Pyrenees are gorgeous. 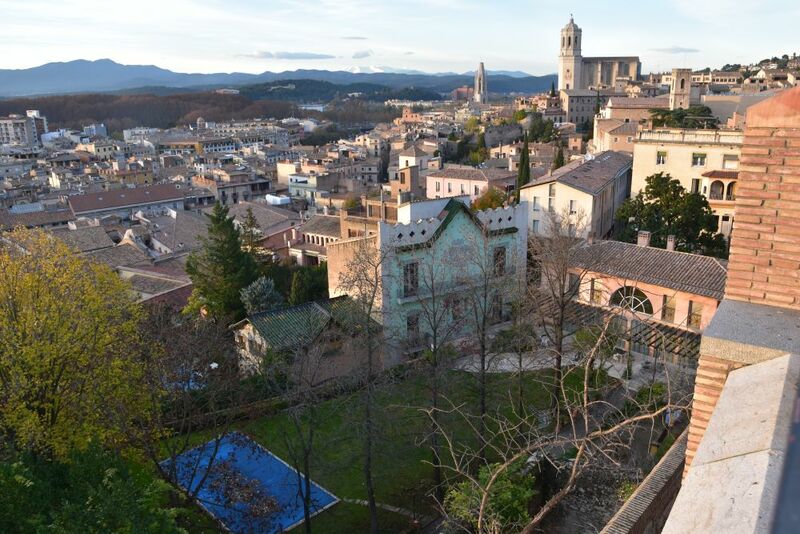 To the right is the Cathedral and to the left San Feliu church – they are dominating the landscape of roofs. In the backogrund, THE mountain of the Catalans, the Canigou, has already been covered with snow. 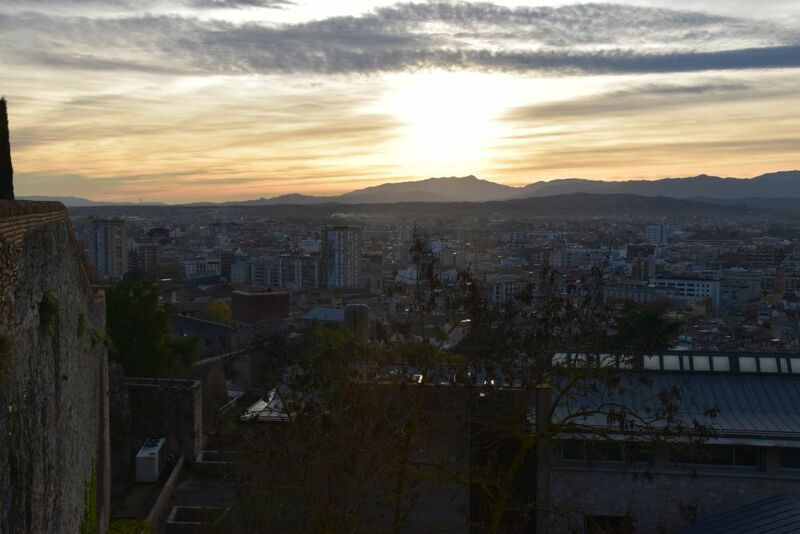 The sun is setting and we return to our hotel Carlemany to enjoy dinner. 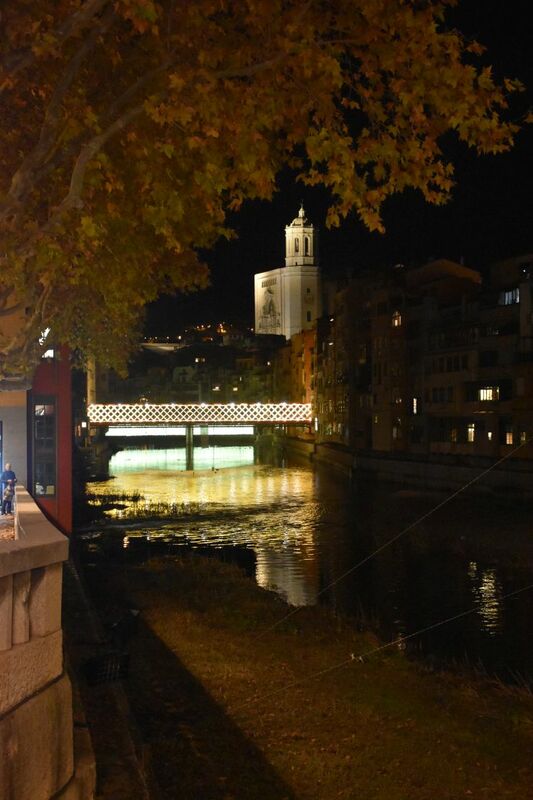 Good-bye Girona, it was a wonderful visit. Source: Fritz René Allemann und Xenia v. Bahder: “Katalonien und Andorra”, Dumont Kunst-Reiseführer, Köln 1980.